Race Nights - Neil Drover - agency for live music, presenters and entertainers. Race Nights are great fun and ideal for charity fundraising, corporate events, parties and staff nights. Race nights come with large screens, stands, a bookmaker, tote cards, Sound system ,disco and DJ if required. The standard race night consists of eight races including one auction race where the D.J auctions the horse. We can provide experienced MC’s to host your fundraising event with a disco + DJ we also hire out our top quality race night in a wide range of packages. 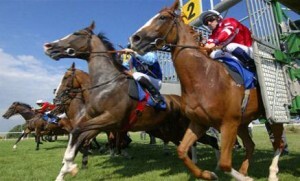 We offer a range of horse race packages and greyhound race packages, ranging from 6 to 9 races in each. Our casino packages also come in a variety of choices. Choose between Las Vegas, Monte Carlo or Atlantic City themed casino hire, which include roulette wheels, blackjack tables, fun money and instruction leaflets.